a) Flawed AVM – At the parcel level (bottom-up), a competing Market AVM does not surgically identify the over-valued parcels on the roll; it usually cross-validates the roll values (as the AVM generating the roll and the challenger tax AVM share the same or very similar sales complexes and attributes). b) Failure to Establish the Ratio – While a leading local law firm may take the initiative to challenge the ratio (top-down), consultants rarely spend that extra money to study, negotiate and establish the ratio. An unadjusted Market AVM is therefore utterly ineffective. A prudent consultant must study and establish the ratio first, leading to a Ratio-adjusted Market AVM. Though an adjusted Market AVM is better than an unadjusted one, it nevertheless succumbs to an inherently inappropriate methodology given the market being targeted. Market research based off an inaccurate AVM could be more counter-productive meaning a vast majority of the real “meaty” cases could remain unidentified. 1. A Custom Tax Appeals AVM, not a Market AVM, is in order to Identify Over-valued Parcels on the Roll – A Tax Appeals AVM is a specialized AVM that surgically identifies and categorically defines the over-valued parcels, irrespective of the original construction of the roll, i.e., AVM or Comps-derived. For example, after having identified the over-valued parcels on the roll, our proprietary Tax Appeals AVM breaks them down into three default categories: a) MaxiMax (ex: 30% & above), b) MaxiMid (ex: 20-29%) and c) MaxiMin (ex: 10-19%). Of course, the categories can change based on client requests. Though MaxiMax represents the most over-valued category, it’s generally the least liquid (lowest frequency), while MaxiMin tends to be the most liquid. 2. A Custom Tax Appeals AVM Offers Biggest Bang for the Buck – Although a Custom Tax Appeals AVM is more expensive than a generic Market AVM (as it is sold to a wide variety of users including the competing appeals consultants), it identifies the truly over-valued cases, thus offering much bigger bang per buck. Moreover, by walking down on the curve (MaxiMax to MaxiMid to MaxiMin), a consultant ensures targeting the most over-valued (hence most profitable) cases first. In other words, if a new consultant decides to target only the top two categories in the first year, s/he still achieves the biggest bang for the buck, potentially expanding into the third category in the following year. On the other hand, a Market AVM is a total hit or miss for appeals consultants, without any assurance that the most over-valued would be targeted at all. 3. A Custom Tax Appeals AVM makes Marketing a Scientific Exercise (Smart Marketing) – Since Appeals AVM precisely identifies and categorizes the over-valued parcels, the market penetration (targeting those homeowners) becomes an extremely easy exercise. Depending on the liquidity of the tranches, homeowners could be invited to attend outreach seminars. Due to the uniqueness and accuracy of the Tax Appeals AVM, a vast majority of those homeowners will – for the first time – find out how they are being over-assessed. In fact, this precise and scientific approach will help discover a market hitherto unknown and unexplored. While the clueless competition will continue to pour in money on useless Market AVMs chasing the meatless-to-less meaty market segments, this new generation of consultants will sign up the truly over-assessed clients at a rapid rate, proving that marketing is more a modern day science than an age-old art. Since this is primarily a contingency business (tax savings are generally split), targeting the right market segments is the key to success. Custom Tax Appeals AVM provides that scientific base. A. Acquire the Tax Roll from the Jurisdiction – As soon as the tax roll is published, they need to acquire a soft copy with a year worth of sales, should they decide to research the ratio. In fact, obtaining the sales data is highly recommended as the ratio study would get them started with the top-down knowledge as well. 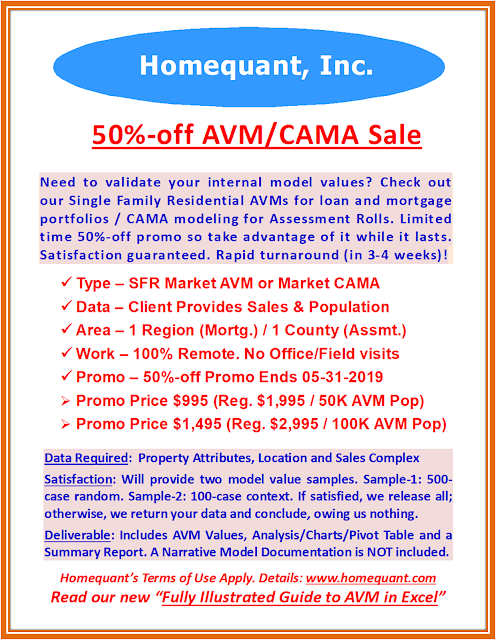 While negotiating with the AVM consultants, they should bundle the ratio study for a better price (if not free). The cost of the tax roll varies by the jurisdiction – free to low cost to $100’s of dollars. For instance, our county charges $10 for the entire roll including sales. In order to keep the cost of data manageable, the data pertaining to certain zip codes could be thought of (of course, the ratio study will require sales from across the county). B. Subscribe to a Comps Program – While the AVM will point to the over-valued cases, it does not replace the individual comps reports needed at the hearing. Brokerage sites are inadequate for two reasons: a) they show primarily the active listings, and b) even if they carry the recent sales, they do not provide the pre-formatted comps reports. The programs that allow dollar adjustments in terms of (sales) time and quantitative variables are preferred. While evaluating the various commercially available programs, the ease of use and flexibility of the adjustment matrix (where the coefficient values are stored) must be closely examined, to avoid having to deal with significant wasteful time and agony during the crunch time. Needless to say, month-to-month subscription contracts are preferred to annual contracts as the need to process comps reports would last only two to three months. Other basic business (including LLC, etc.) and bulk mailing costs must also be factored in. C. Two Complementary Minds could do Miracles – Teaming up with a buddy with complementary skill-set could be the way to go. Since the targeting window is quite short-lived, the outreach seminars could thus be simultaneously offered in two different parts of the town/county. The complementary skill-set works better as the business grows so one could handle operations and technical aspects while the other could concentrate on the marketing side. The advantage of the two-partner team from the get-go is that it helps create similar passion, knowledge and forward thinking. People who pursue part-time opportunities must also know the conflict of interest rules their full-time jobs generally impose (no need to jeopardize the full-time job! ).